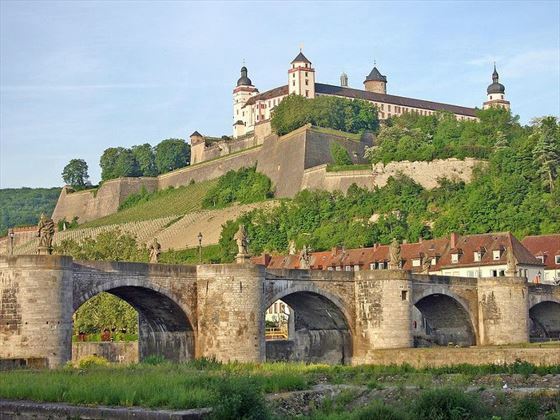 Start your holiday with a couple of nights in the captivating town of Wurzburg on the banks of the River Danube, followed by a relaxing seven night cruise along this iconic river. 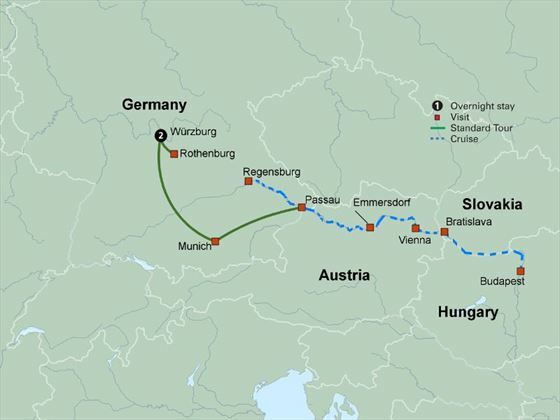 Enjoying the comfort of your state-of-the-art ship, with all meals with wine included for the duration of the cruise, and experiencing guided tours by local experts in the superb historic locations along the way, will ensure that you be treated to the best that this beautiful region has to offer. This morning join a local guide to take a leisurely paced walking tour of Wurzburg including a visit to the spectacular Prince-Bishops Residence where you will see one of the largest ceiling frescos in the world. You will also see the ornate Alte Mainbrucke – the oldest bridge on the River Main. 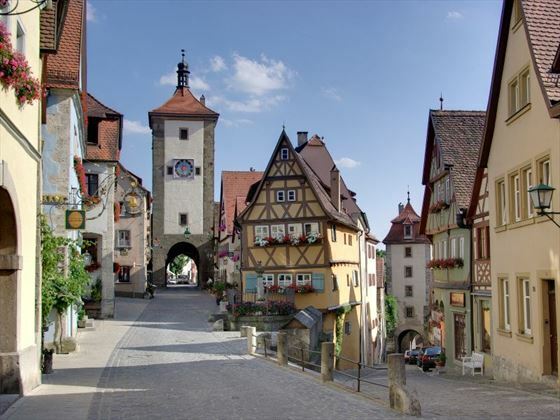 Travel to Rothenburg, a beautifully preserved medieval walled town, where you will enjoy free time to explore at your own pace. Return to Wurzburg for an evening at leisure. 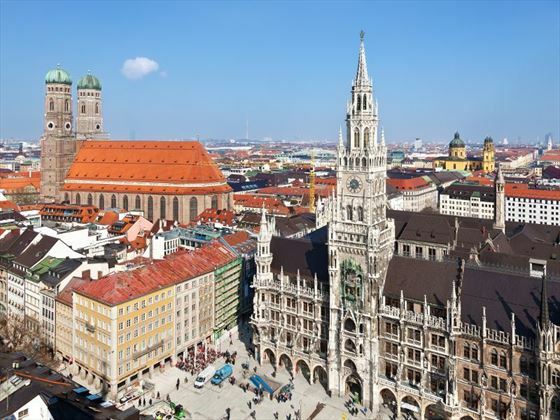 Travel to Munich to experience a panoramic city tour, taking in the Olympic Park, world-famous Glockenspiel and Marienplatz – a beautiful square surrounded by lively cafés and shops. Enjoy some free time before travelling onto Passau. Here you will join your cruise ship, which has been specially selected to offer a high level of comfort and service, excellent cuisine and wine, with panoramic deck, salon and bar. This evening enjoy a special welcome dinner on board. Today enjoy a guided walking tour of ancient Regensburg, a truly magnificent medieval city with over a thousand historic buildings. You will see the roman city gate built in the year 179 and the old Town Hall – the Alte Rasthaus. Next see the first stone bridge ever built over the Danube, the aptly named Stone Bridge built in the 12th century. In the afternoon take a stroll through the charming old town, then return to your ship which will depart for Passau. Cruise into Passau, a 2,000 year old fairy-tale city in a breath-taking setting where the three rivers Danube, Inn and Ilz converge. 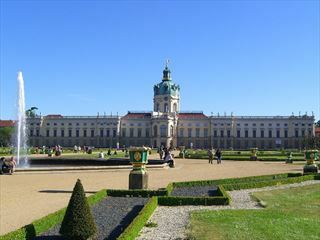 Take a leisurely paced walking tour, exploring the quaint cobblestone streets and beautiful Baroque architecture, taking in spectacular St Stephan’s Cathedral which is home to Europe’s largest church organ. Later you will have free time to enjoy this beautiful city at your own pace. 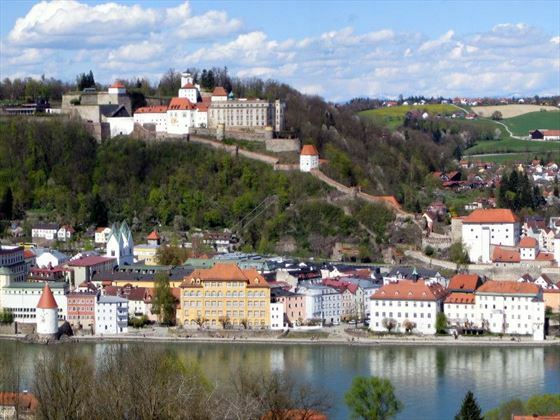 Today you can choose to sit back, relax and enjoy the scenery as you cruise through Austria, or take an optional excursion to the town of Durnstein and the spectacular 900-year old Benedictine Melk Abbey – one of the largest Baroque monasteries. In the afternoon continue cruising through the picture-perfect Wachau Valley, with hillside castles and riverside villages. 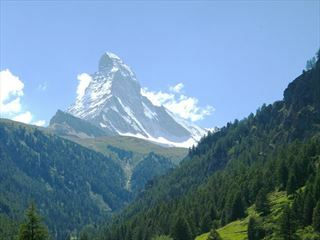 You will arrive in the elegant capital city of Austria, Vienna, in the early evening. 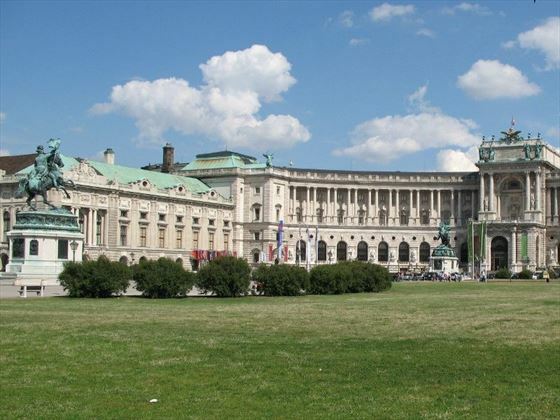 This morning join a local expert to explore Vienna’s imperial architecture with highlights being the lavish Horburg Palace, the impressive Vienna Opera House, awe-inspiring St Stephen’s Cathedral and the Ringstrasse – the beautiful street encircling the old town. This afternoon you have the opportunity to explore this elegant city at leisure, stroll the lovely pedestrianized Kartnerstrasse or indulge in a pastry in a traditional café. 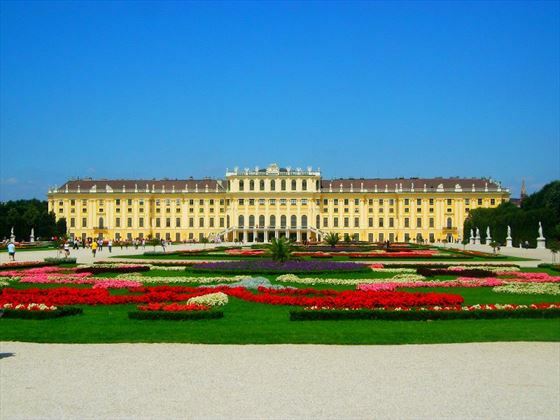 There is an optional excursion if you wish, to the opulent Schoenbrunn Palace – the summer retreat of the Hapsburg dynasty for hundreds of years until the early 20th century. 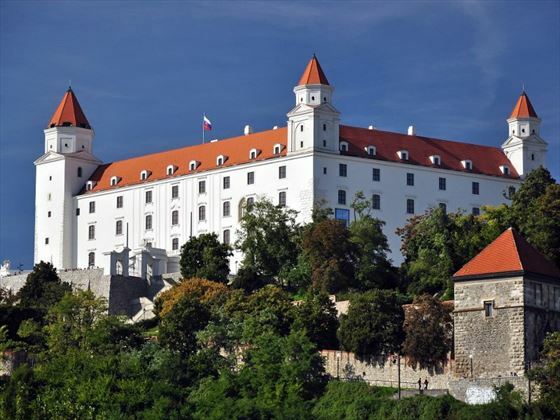 Today you will tour Slovakia’s fascinating capital, Bratislava, and with highlights of the city’s historical sites including the 13th century castle, the old town, St Martin’s Cathedral and the Archbishop’s Palace. The afternoon you have at leisure to explore this captivating city. This evening you are invited to attend the Captain’s Gala Dinner. 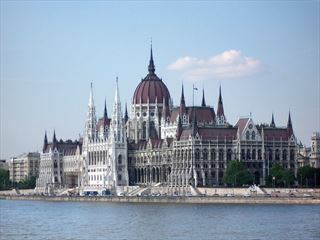 Cruising into Hungary, you will disembark in the morning for a tour of Budapest – the enchanting capital city. You will explore the historic Buda Castle area, Fisherman’s Bastion and 500 year old St Matthias Church, and enjoy spectacular views of the twin cities of Buda and Pest on either side of the River Danube. Tonight there is a farewell dinner with your fellow travellers, followed by a fun folklore show.